Will basking in the ‘thought of Grace’ (in different situations) threaten one’s practice in subduing the ego and rather enriching it? In my humble opinion it depends on the mind-set of the people. When Grace has begun to manifest in one’s material life, it is sure to guide one to the ultimate as well. In my humble opinion, may be one will be caught in the snares of materialism in the beginning. However the manifestation of Grace in one’s material life also brings about exhaustion in the enjoyment of material pleasures, bringing in discrimination. One understands that all pleasures are time bound and one starts yearning for the eternal. Being already in the Guru’s fold, the manifestation of Grace diverts the attention from the end achieved to the thought of Bhagavan Himself. 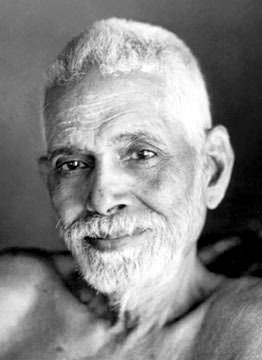 Bhagavan Ramana becomes the object of one’s thoughts. A friend (a Ramana follower, steeped in the practice of Self enquiry) once asked me, “Why are you so enamoured by Him (His form)?” Another (an ardent devotee of Bhagavan) cautioned me on my yearning to visit the ashram for the creation of fresh vasanas or impressions. In both the cases the questions clearly pointed out an attachment on my side to the Guru’s form. While (purely by His Grace) that I make a little effort to practise His teachings, in my humble opinion, I feel that while I am attached to my own form and other forms in the name of relationships (though in the process of making efforts in practising), I feel that an attachment towards the Guru’s form begins to culminate the attachment to all other forms in His. Furthermore attachment to the Guru’s form brings about liberation and not binding as in other attachments. From another angle, manifestation of Grace and the thought of it slowly but surely endows the spirit of surrender in one. Having seen Grace manifested in different occasions, the sense of doer-ship slowly gives way to surrender as one understands clearly the exercise of the higher power. Living slowly becomes effortless. Even while we follow Self enquiry steadfastly (by enquiring ‘Who am I’ with the rise of every single thought, which is absolutely necessary), the very existence of the idea of engaging in the thought of Grace will slow down one’s practice will also have to be questioned. Is Bhagavan not both within and without? However whatever mind-set one has and wherever one stands in his practise, Ramana’s unfailing and compelling Grace will no doubt guide the seeker in realising the truth of himself. This is a beautiful, flawlessly written article. I do hope lot more people read all that you are sharing. Thank you so very much for finding the time to read the posts as well as commenting. I was actually wondering if the 'thought of Grace' in the way of little miracles can actually get one egoistic, because the Master's hand is there in very small little aspect in life. However I realised that it facilitates surrender. I also realised that it is His Grace that puts one on His path of Self Enquiry. That is the biggest miracle. In my humble opinion, holding on to the practise of self enquiry and holding on to Him is one and the same. It depends on each other's mind set. Further more in my case, to be honest, I do not employ every single minute that I am free for self enquiry. The mind does somehow goes towards external things. So that way it is better that it lingers on His Grace. Even the thought of not wanting to think of His Grace is also a thought. When we stand ASIDE and watch our practise of SE and holding on to Him, it is all one and the same, because we are not the one who is practising or holding. However not worry too much because He Who has brought us this far will guide us further. Om Namo Bhagavate Shri Ramanaya.